This volume brings together some of the most distinguished experts on Vizenor’s work from Europe and the United States. Original contributions by Gerald Vizenor himself, as well as by Kimberly M. Blaeser, A. Robert Lee, Kathryn Shanley, David L. Moore, Chris LaLonde, Alexandra Ganser, Cathy Covell Waegner, Sabine N. Meyer, Kristina Baudemann, and Billy J. Stratton provide fresh perspectives on theoretical concepts such as trickster discourse, postindian survivance, totemic associations, Native presence, artistic irony, and transmotion, and explore his lasting literary impact from Darkness in St. Louis Bearheart to his most recent novels and collections of poetry, Shrouds of White Earth, Chair of Tears, Blue Ravens, and Favor of Crows. The thematic sections focus on “Truth Games’: Transnationalism, Transmotion, and Trickster Poetics;” “‘Chance Connections’: Memory, Land, and Language;” and “‘The Many Traces of Ironic Traditions’: History and Futurity,” documenting that Vizenor’s achievements are sociocultural and political as much they are literary in effect. 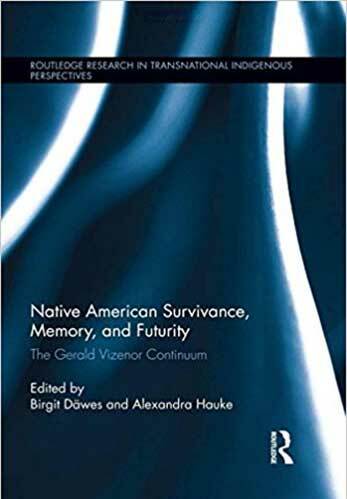 With their emphasis on transdisciplinary, transnational research, the critical analyses, close readings, and theoretical outlooks collected here contextualize Gerald Vizenor’s work within different literary traditions and firmly place him within the American canon. Däwes, Birgit and Alexandra Hauke (eds. ).